Laurits Andersen Ring (1854–1933), Harvest (1885), oil on canvas, 190.2 x 154.2 cm, Statens Museum for Kunst (Den Kongelige Malerisamling), Copenhagen, Denmark. Wikimedia Commons. Hans Andersen Brendekilde’s friend Laurits Andersen Ring (1854–1933) was born to a rural craftsman and farmer’s daughter in the village of Ring in the south of Sjælland (Zealand), Denmark. With his older brother due to take over his father’s wheelmaking and carpentry business, Laurits was indentured as an apprentice to a local painter. In the next four years, he found himself in the capital city of Copenhagen, and started private classes in fine art painting. By 1875, his creative painting was good enough to earn him a place at the Royal Danish Academy of Fine Arts, where for a period he was taught by P S Krøyer. At some time between 1877 and 1881, he met Hans Andersen (as Brendekilde was known at that time) at the Academy, and they became great friends. In 1881, when they were preparing to exhibit their paintings together, the two Andersens decided that their common surnames could only confuse. So from then on, Laurits was known as Laurits Andersen Ring, and most widely simply as L A Ring. Laurits Andersen Ring (1854–1933), A View of the Gas Works Harbour (“Gasværkshavnen”), Copenhagen (1882), oil on canvas, 20 x 38 cm, location not known. Wikimedia Commons. From the outset, Ring painted landscapes, many of which were at least started in front of the motif. A View of the Gas Works Harbour (“Gasværkshavnen”), Copenhagen (1882) is an early example, and despite its grim title – gas works in those days were associated with coal and the generation of ‘town gas’ from that coal, a messy and smelly process – shows great promise. Ring painted this on 4 July, probably shortly before midday, judging by the shadows. Although Ring and Brendekilde exhibited together in 1882, neither met with success at that stage. Ring became quite depressed and frustrated, and for some time considered emigrating to the US, which was popular throughout the Nordic countries at the time. Ring became politically active, supporting the new ‘left’ who were calling for an end to the conservative government which had been in power under JBS Estrup as Prime Minister since 1875. Some students, including Ring, formed a revolutionary group known as the Rifle Movement, which intended taking up arms to overthrow the government. 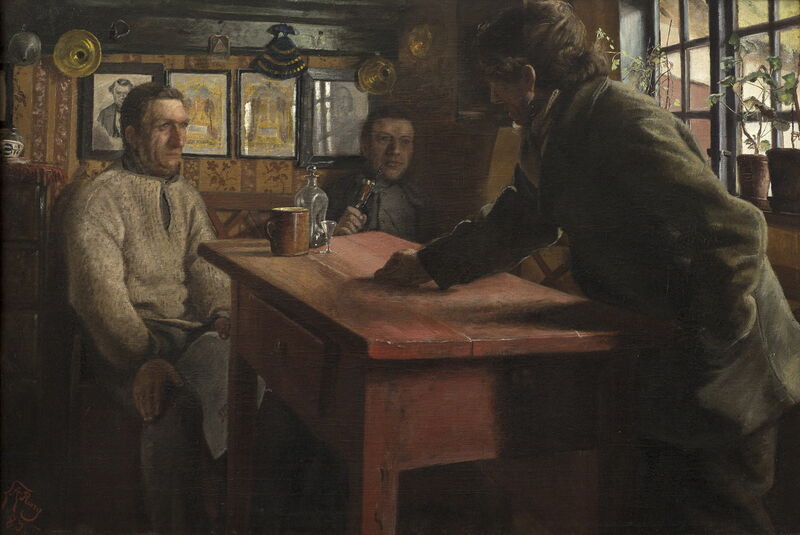 In June 1884, Ring finally attained recognition, with this painting of The Lineman. The railways were the great innovation of the middle and late nineteenth century, which changed the countryside in many ways, from synchronising clocks across each country to ‘railway time’, and bringing daily newspapers, to enabling people to travel far and wide. 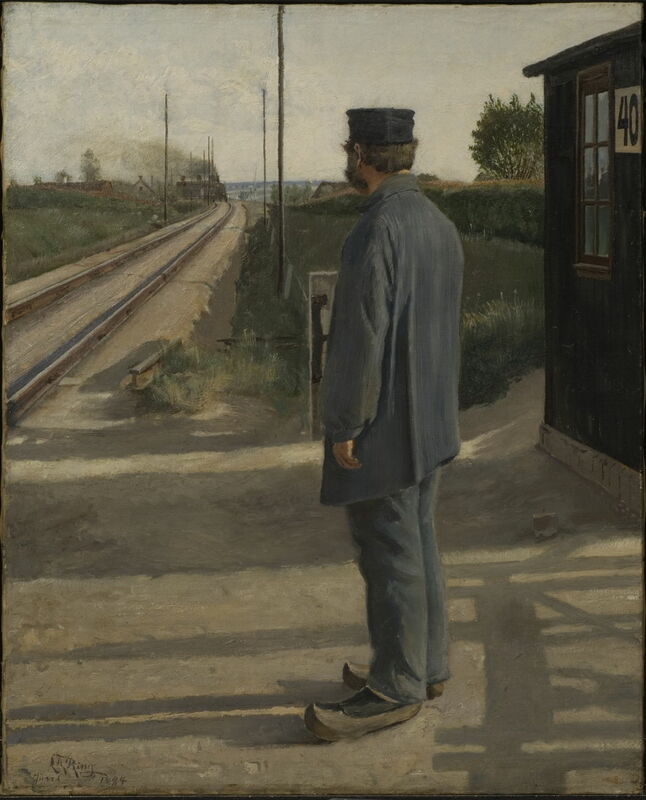 Ring’s railway worker may stand in his uniform looking at the oncoming steam train, but he still wears wooden clogs, has round shoulders, and is poor. As much as the new railways might have brought benefits to the country, they also took people away to the cities, worsening the plight of rural communities. Laurits Andersen Ring (1854–1933), A Boy and a Girl Eating Lunch (1884), oil on canvas, 44 x 56 cm, location not known. Wikimedia Commons. Ring was even more pointed in the social message in A Boy and a Girl Eating Lunch, from the same year. 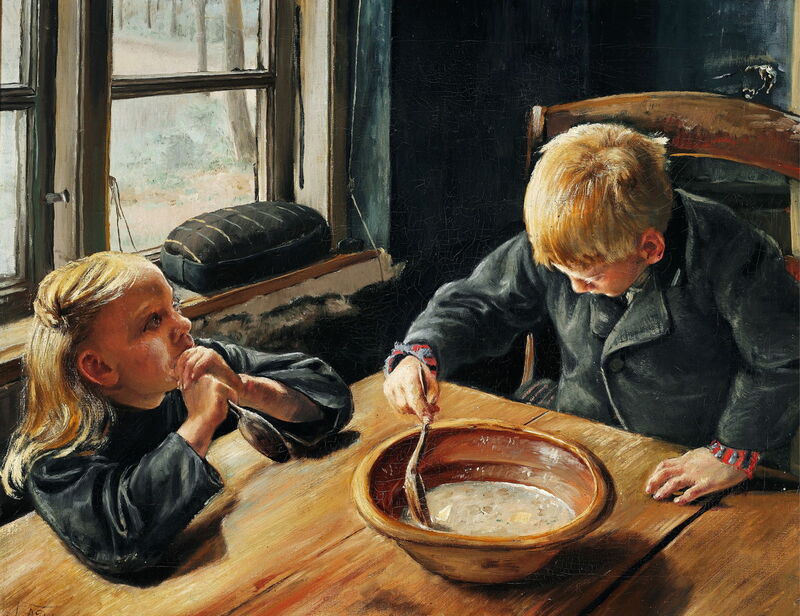 Paupers’ children, they have a single bowl of broth between them. The girl looks up in tears, hoping for a miracle to change their lives, and take them away from the bare wooden table and blackened walls. Laurits Andersen Ring (1854–1933), Young Girl Looking out of a Roof Window (1885), oil on canvas, 33 × 29.5 cm, Nasjonalgalleriet, Oslo, Norway. Wikimedia Commons. 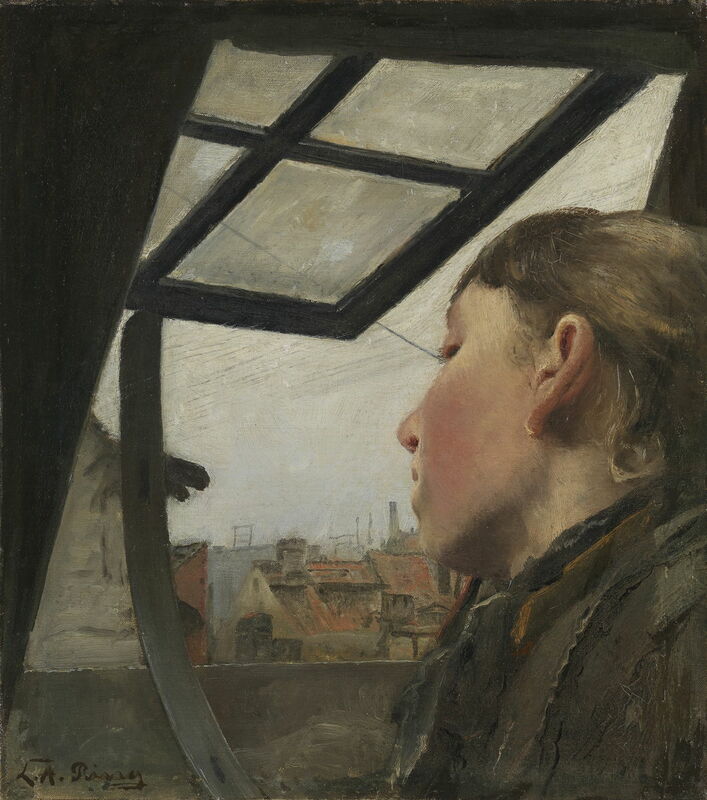 The following winter, when he was trying to keep warm in his attic in Copenhagen, Ring painted this remarkable scene of a Young Girl Looking out of a Roof Window (1885). As Ring himself must have done, she peers out of the open window at the urban roofscape around her. Although we are so close to her, her face is turned so that we can barely see any of its features, just the grey day and the distant rooves and chimneys. 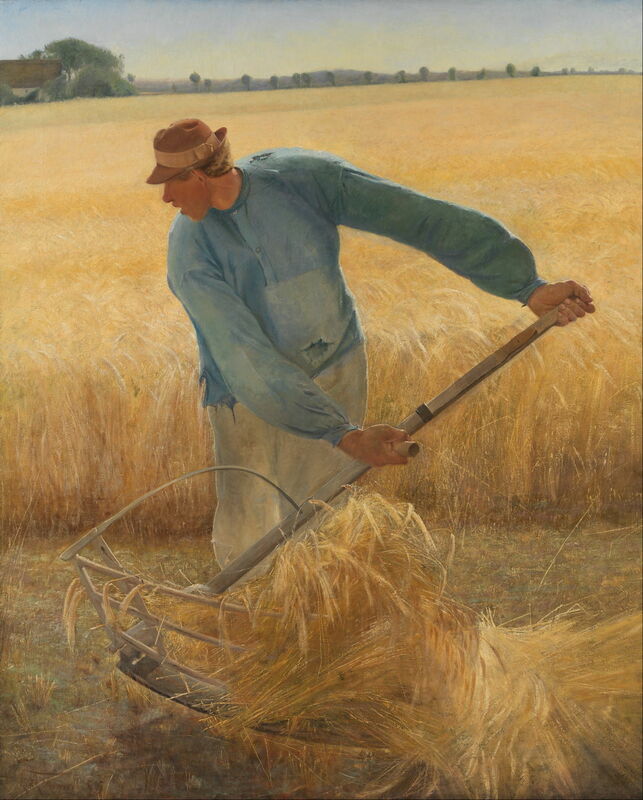 In the summer of 1885, Ring got his brother to model for his “monument to the Danish peasant”, Harvest, which he later copied in a smaller pastel. Ole Peter Andersen is seen working on his farm near Fakse, also on Sjælland, amid seemingly endless wheatfields. He swings his scythe with arms which billow beyond normal length, his right shoulder dropped away almost to nothing. Laurits Andersen Ring (1854–1933), Political Discussion. Abenæs near Gaunø (1885), oil on canvas, 64 x 94 cm, Statsministeriet, Copenhagen, Denmark. Wikimedia Commons. In his Political Discussion. Abenæs near Gaunø (1885), Ring paints a popular theme among Naturalist painters, the often heated debates which raged through rural society. Two men look on in silence, one puffing at his pipe, as a third holds forth, probably expounding views of social reform from the ‘left’. 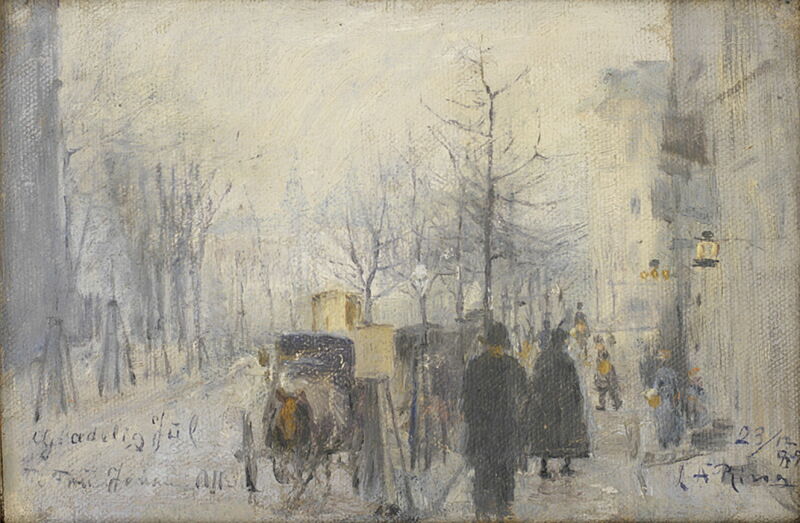 Ring is claimed to have returned to P S Krøyer to study further in 1886, but for him the most influential event was the sudden death of his brother, Ole Peter. Laurits Andersen Ring (1854–1933), Evening. 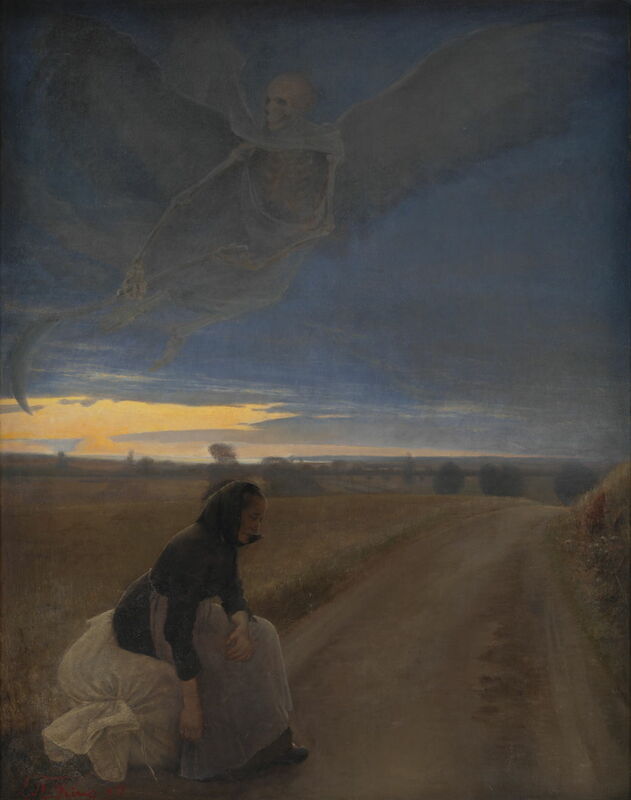 Death and the Old Woman (1887), oil on canvas, 121 x 95 cm, Statens Museum for Kunst (Den Kongelige Malerisamling), Copenhagen, Denmark. Wikimedia Commons. Were it not for the huge and ghostly figure of death in the sky, Ring’s Evening. Death and the Old Woman from 1887 would seem to continue his theme of rural poverty. An elderly woman sits at the roadside on a huge sack which she is clearly unable to carry. She is alone, it is the end of the day, and the sun has just set behind her. Here comes winged death, the skeleton bearing his scythe, ready to take her away. Laurits Andersen Ring (1854–1933), Smallholders in the Village of Ring (1887), oil on cardboard, 28 x 36 cm, location not known. Wikimedia Commons. From 1879 for a period of about a decade, the Norwegian painter Christian Krohg had painted the Gaihede family of Skagen, Denmark. Although Ring never attempted such a grand project, his Smallholders in the village of Ring from 1887 has common intent. ‘Polish Niels’ made his living as the plumber in Ring’s native village, and supplemented those earnings selling seeds. He is here making paper bags in which to sell his seeds, as his wife is engaged in knitting. Laurits Andersen Ring (1854–1933), Mogenstrup Church (1888-89), oil on canvas, 61 x 86.7 cm, Den Hirschsprungske Samling, Copenhagen, Denmark. Wikimedia Commons. 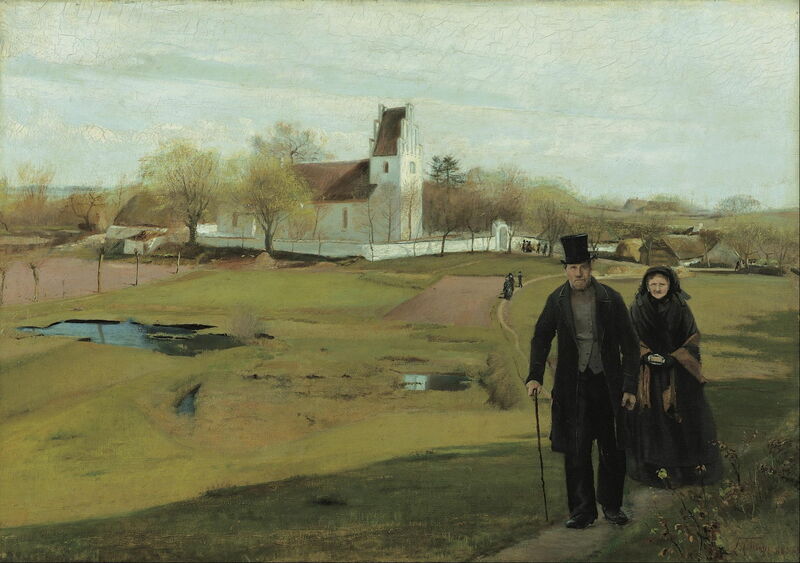 Mogenstrup Church (1888-89) shows an elderly couple in their tattered Sunday best clothing, slowly making their way home after attending this church, which was near the village of Ring. His shoes are still polished and his top hat also shiny, but like many country couples these two were no strangers to hunger or deprivation. As it is now early spring, at least they have managed to survive the winter. Low-lying land here is often so sodden that it breaks into bog surrounding water. Ring made friends with a lawyer and amateur painter who lived in Copenhagen, and for several years had a very close relationship with his wife, Johanne Wilde. Her husband Alexander worked in the Ministry of Finance at this time, and was renting a studio adjacent to Ring’s. Ring suffered bouts of depression, and the Wildes looked after him in their home at Frederiksberg and their summer house at Hornbæk on the north coast, where he spent time when he wasn’t travelling in quest of motifs. 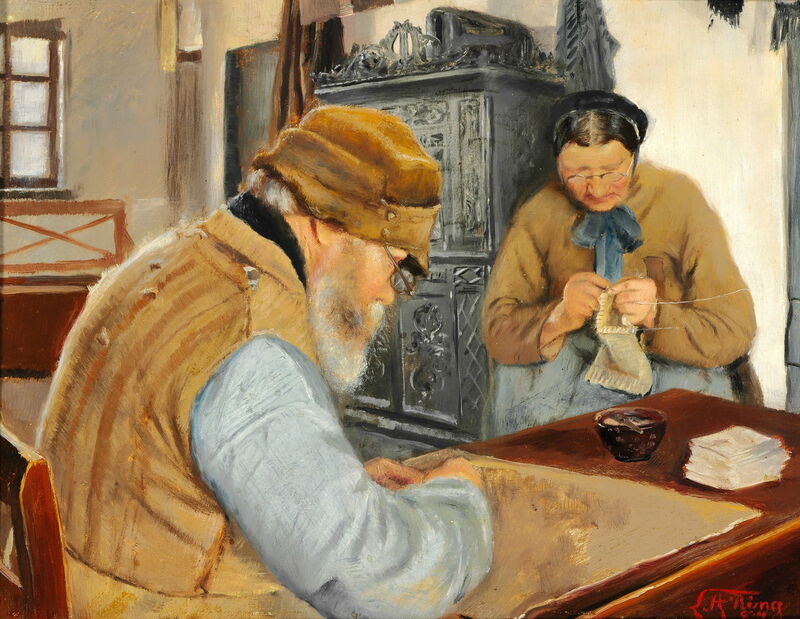 Laurits Andersen Ring (1854–1933), Johanne Wilde at Her Loom (1889), oil on canvas, 40 × 37.5 cm, Private collection. Wikimedia Commons. 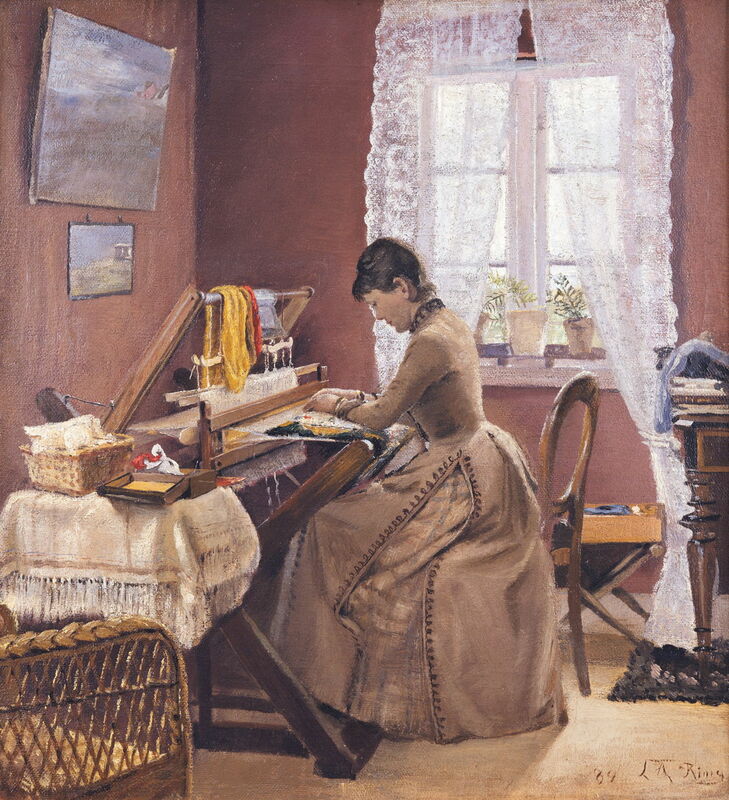 Ring painted this wonderful portrait of Johanne Wilde at Her Loom in 1889, and gave it to their young daughter Ellen on 31 December 1892, as their friendship was slowly dissolving. The paintings on the wall shown here are not Ring’s, but those of Johanne’s husband, to whom she remained faithful. This was painted in their house at Hornbæk during their summer holiday there. Laurits Andersen Ring (1854–1933), View From the Window in Café Osborne up to Frederiksberg Allé (1889), oil on cardboard, 14 x 21.3 cm, Statens Museum for Kunst (Den Kongelige Malerisamling), Copenhagen, Denmark. Wikimedia Commons. My final choice from Ring’s paintings of this decade may come as a surprise: his wonderfully Post-Impressionist oil sketch of the View From the Window in Café Osborne up to Frederiksberg Allé from 1889. Painted on 23 December 1889, its inscription wishes the recipient a happy Christmas. Next week, I will look at their paintings from the 1890s. Posted in General, Life, Painting and tagged Andersen, Brendekilde, Denmark, Krøyer, Krohg, naturalism, painting, realism, Ring. Bookmark the permalink.